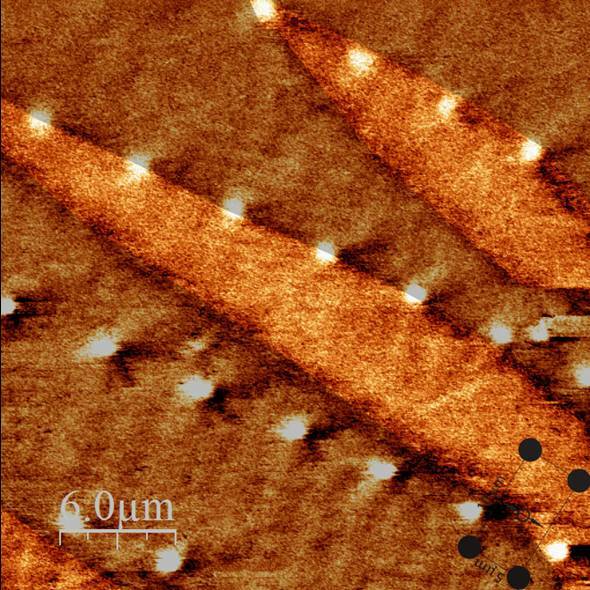 A type of nanostructure made available by the current microfabrication techniques is the inclusion of an array of nonmagnetic regions (holes) defined within a magnetic thin film (see Fig. 5.1). These magnetic elements are known, in opposition to dots, as antidots. The magnetic thin film dipolar energy associated with the magnetic poles present at the surfaces of the array motifs can override the magnetocrystalline anisotropy and largely determine the global demagnetization of the system. Hence, the coercivity of the antidot film can present a substantial increase compared to that of a continuous film. Additionally, the symmetry of the array determines that of the induced magnetic anisotropy, for example square and hexagonal arrays give respectively fourfold and sixfold anisotropies [Wang 06]. The use of different lithographic techniques, which include electron beam [Adeyeye 97], ultra-violet [Wang 06], focused ionic beam [Toporov 00], x-ray [Ruiz-Feal 02] or interferometric lithography [Vavassori 99], and anodic aluminium oxide membranes [Xiao 02] makes possible to fabricate highly regular antidot arrays with antidot sizes and interantidot distances with values going from a few tens of up to the units of . 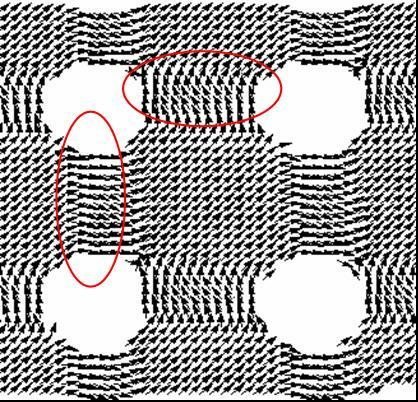 The imprinted motifs found in the literature are square [Heyderman 06], rectangular [Wang 04], elliptical [Guedes 00] and circular [Ruiz-Feal 02] holes. The techniques that allow to systematically vary the geometrical parameters (i.e size, shape and symmetry) and the dependence of the magnetic behavior on such parameters open the interesting possibility of tayloring the coercivity. Figure 5.1: SEM image of an antidot Fe film from the Ph. D. thesis of J.M. Torres [Torres 05]. Figure 5.2: Magnetization distribution in closely packed antidot film. The circles indicate where the bits would be stored in the proposal of magnetic recording in Ref. [Cowburn 97]. Besides the engineering of the coercivity, the use of antidots arrays has been suggested for magnetic recording applications. The antidots films have been proposed as potential recording media, where the bits are stored in the interantidot region [Cowburn 97] (see Fig. 5.2). This implementation is favored by the absence of any superparamagnetic effect, due to the large volume that is relatively strongly coupled, compared to the set of nearly isolated grains that constitute conventional media. The main disadvantage of the use of antidots arrays is linked to the potentially high noise-to-signal ratio originated by the bit transition, which should have in these arrays a width of the order of the material exchange correlation length [Jalil 03]. In fact, the potential recording media in order to be promising enough have to be not obsolete compared with the current technology when the candidate would reach production stages. Another proposal for the use of such structures is the Percolated Perpendicular Media [Zhu 07]. The medium consists of exchange coupled grains and densely distributed nonmagnetic columns (antidots). The non-magnetic inclusions act as pinning centers and yield smooth transition boundaries, thus reducing transition noise while the thermal stability is not degraded. Another possible application is related to the implementation of different types of stress and magnetic field sensing devices for which the occurrence of reversible magnetization variations in large field ranges is desirable [Gonzalez 05]. Figure: (a) MFM image of an antidot Fe film in the concentrated regime from the Ph. D. thesis of J.M. Torres [Torres 05]. (b) MFM image of a film patterned with circular holes where the pinning of the domain wall by the line of antidots is observed (from G. Rodríguez Rodríguez of the Universidad de Oviedo). Concentrated regime. The antidots are close enough that the magnetization structures that are created by the antidot surface occupy the antidot region and create a highly inhomogeneous domain structure (the antidots ``interact'', see Figs. 5.2 and 5.3(a) ). The magnetic anisotropy is dominated by the induced anisotropy resulting from the spatial preference of the created structure. Diluted regime. In this regime the antidots are far enough to be considered isolated and do not appreciably alter the magnetic anisotropy as can be observed in Fig. 5.4. The effect of the dots is to act as pinning centers for the domain walls propagating through the sample, which is shown in Fig. 5.3(b) [Pérez-Junquera 06]. The length of the magnetic structures created around the antidots is determined by the exchange length in the considered material. Therefore, in the diluted region the separation between antidots is several times larger than this quantity. Figure: MFM image of a film patterned with circular holes extracted from the Ref. [Pérez-Junquera 06]. One of the main problems raised by the patterned films is that related to the understanding of their demagnetization processes and, especially, the relationship between those processes and the array geometry and dimensions. Due to the dipolar energy minimizing structures at the antidots surfaces, the films can exhibit significant spatial inhomogeneities in the magnetic moment distribution, which can largely influence the global behavior of the system and make difficult the description in simple terms of the magnetization reversal. In this chapter we will analyze the magnetization reversal in patterned films on the basis of a comparison between the micromagnetic simulations and the experimentally measured coercivity in Fe antidots films.